9mm Steyr ammunition is a very robust round chambered for one of the most robust and well designed pistols in the 20th century. The 9mm Steyr was produced in1911 to replace the 8mm Steyr. The 9x23 mm Steyr was adopted by all of the branches of the Austria-Hungary military during the First World War. At the time, the Austrian-Hungarian military was one of the most modern and well equipped armies in the world. In the post War World the round found service in Romania and Chile. 9mm Steyr ammo was also loaded in 1911 clones for countries which restricted the use of NATO or military rounds, like Mexico. The cartridge is quite robust and was one of the earliest 9mm rounds to use the idea of smaller lighter rounds, with extremely high velocities. This produced a smaller, easier to manufacture round, which was more controllable than larger loads. These high velocity rounds were more apt to penetrate barriers than larger, slower rounds as well. I want to give a bad review for this as I don't to share, but that's un-American. This ammo worked great for my 1917 Steyr pistol and I plan on buying much more! Excellent customer service as well. 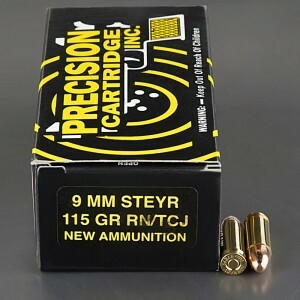 I couldn't find non-corrosive 9mm Steyr ammunition anywhere but at Ammo To Go. It saved me having to buy brass and load my own. I received the order in just a few days, which really exceeded my expectations. My 1912 Steyr pistol worked perfectly with this ammo, and I had no malfunctions. Thank you, order was shipped promptly. Actually received earlier than expected. The product work perfectly in over 100 years old pistol.